Drawn and its sequels are widely considered to be some on the best puzzle games ever released. The beautiful art, plot and clever puzzles make these outstanding computer games, and they are available now in a number of formats. Unlike many games the quality does not decline through the series, and the plot remains intriguing as the player learns more. Save Iris. Save the kingdom. The best word to describe this game is atmospheric. It is haunting, and everything: the music, the artwork, the voices, combine to produce a suspenseful and immersive experience.Drawn's rather unique idea is that each of the tower's paintings is a different world. Each has a different look, different music and different characters. By repairing the paintings and restoring the inhabitants, you can get assistance, aid, and advice from them that helps you as you travel up the tower. The ability to move items in and out of paintings is vital to the plot. Suitable for all ages, there is little violence in this game and most of what there is is cartoony (as in, you are inside a pirate cartoon at the time). What there is is a great story, a wonderful supporting cast and a truly unique gaming experience. The gameplay is a mixture of point and click, and puzzle solving. Puzzles can be skipped after a while, but as they are well designed and interesting, it is worth giving them a try at least. Available for PC, and now Android, Apple and more, Drawn was released by Big Fish games, and remains one of their best titles. Franklin, Iris' guardian who was turned to stone by dark magic. He is your adviser and guide through the tower, though he obviously can be of no physical help. Iris, the girl at the top of the tower. Trapped by a curse, Iris is rarely encountered, but in the trip through the tower her presence is felt constantly and her childhood revealed. Drawn: Dark Flight continues immediately after the end of Drawn: Painted Tower. Moving the action swiftly onwards and onto the larger canvas of the town, it is no longer enough to defeat the darkness: now you and Iris have to restore light and hope to the town. Once out of the Tower, the town opens up. As dark and haunted as the tower itself, even here there are allies: torn posters and magic books, writing on the walls and puppets in broken shows, who can be restored and brought to life to fight the darkness. But there are enemies too. The dark king will not let go of his kingdom so easily, and even now seeks Iris to entrap her once more. Lighting the beacons will allow her to break the curse, but with the shadows barring the way, and the mysterious Raven dispatched to stop you and capture Iris, how can you bring light to the darkness? Creative puzzles, a plot that is beautifully simple yet with more than a few twists, and stunning artwork throughout make this less a sequel and more a second half to the first game. The gameplay remains unchanged: a mixture of point and click and puzzles that is deeply immersive, and the game has a real sense of urgency despite there being no time limits, and puzzles being skipable after an attempt. Sadly its video requirements are higher than the first game and my old laptop could not run it (the price of having a 10-year-old vBIOS). Instead we played it on a desktop, and it did not disappoint. The puzzles were if anything, harder, and we actually resorted to skipping one which remains frustrating. And all that said, it is absolutely brilliant game that could be enjoyed by almost anyone. Drawn and Drawn Dark flight are available in a combined edition. Given how closely linked the games are, it is actually worth buying these - otherwise you are likely to finish the first game and then go out looking for the sequel anyway! The third game in the Drawn series, Trail of Shadows is set some years before the Painted Tower. 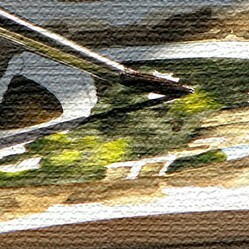 A young boy whose paintings came to life unwittingly unleashes a shadow upon the world and upon his painted landscapes. Free them to free him. It is hard to say what makes the Drawn series so good because it is no single element. Instead it is the combination of elements; artwork, music, characters, voice actors, script. Not only are these perfect for the game, but this is the rare game where there are no weak elements: they've been planned as a single whole and compliment each other perfectly. In the case of the Drawn games the whole is far greater than the sum of its parts. Instead of enemies and combat, Drawn uses looming, haunting, threat. It is not a case of defeating the dark lord's rise, because in the world of Drawn he has already won, and you see the consequences of that in every moment of the game. Watching the world come back to life and light return as you progress is a constant reminder of why you are there, and also one of the most satisfying gaming experiences I have yet had. You can always go back to (and the game requires you to go back to) people you have already saved, in order to save more and the contrast highlights why you need to press on. Okami was a game with a similar brush mechanic to Drawn released on the PS2 and then Wii. Unlike Drawn it is drawn in the Japanese watercolour style, but like Drawn it uses a brush mechanic to drawn items for the protagonists to use. Comparisons with Okami are inevitable, but the biggest difference is in the protagonists. Ammy from Okami is a white wolf and mother goddess, stronger than nearly everything and more than capable of fighting. Iris is serious, intelligent, resourceful, and determined to save her kingdom, but as powerful as she is, she's also a young girl who needs help. You can't defeat the dark king, but you can get Iris the tools to do it. If Okami is a war, Drawn is a resistance movement working in occupied territory, against an enemy who can't be faced directly because the resistance would instantly lose - and does every time he is faced directly. The aim of Painted Tower and Dark Flight is to lure him into a confrontation in the time and place where you have all the advantages, and the only time you might win. I loved Okami, but I also enjoyed Drawn, and there may be many fans of both out there. There are other non-violent PC games available, with a range of plots and types. Here are a few. The long awaited sequel to the classic PS2 game Ico was released in 2005. Journeying to a strange land, a wanderer seeks to revive his lost love, but the cost will be so very high.